Well, we got to hear from our missionary again this week. It was a short email to our dismay but, we won't complaign short is better than nothing! He is getting a new companion and a transfer. He is a little nervous but we all know he will do so well. Last Saturday he had two baptisms, he really had a wonderful, spiritual experience. 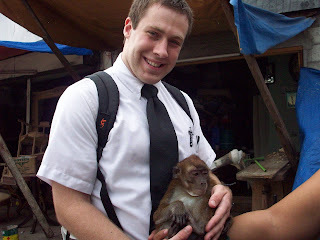 He sent us a picture of him holding a monkey:). He looks like he has lost some weight as well.